Kendrick Lamar has been on a roll over the past month; first he dropped the single “HUMBLE.” accompanied by its stunning visuals, then released his full LP DAMN., followed by a closing set at Coachella in epic fashion and now releasing a fierce video for “DNA.” The video directed by Nabil stars Don Cheadle in four minutes and forty five seconds of cryptic 80s cinema style video. The video starts with Kendrick portraying his newly debuted moniker Kung Foo Kenny (the character that he performed his entire Coachella set as) chained to a table and hooked up to a lie detector. Award winning actor Don Cheadle proceeds to walk in frame and tries to start interrogating Kendrick after stating that D.N.A. stands for “Dead N****r Association.” Many forms of tension are already extremely prevalent in the song by itself but now the video dares to go further by putting Kung Fu Kenny in direct conflict with Don the unnamed interrogator. When Don turns the lie detector machine on things take a turn as Kenny uses some form of mind control to take over. Don proceeds to lip sync the entire song feuding back and forth with Kenny for lyrics. After Kenny wins the battle he hits the street to join a group of his friends. The video ends with Schoolboy Q lighting a blunt and approaching the camera before punching it out. The video has to be seen to understand the hidden meaning behind the combination of lyrics, news clip edits, Kung Fu Kenny Vs. Don and the group of friends in the street. The video is just another piece of Kendrick Lamar’s quest to cement himself as the greatest rapper alive. His new album really comes with the heat, holding no punches against his competition. With appearances on the album such as Rihanna and U2 added with the masterful simplicity of Dr. Dre level production and Kendrick’s out of this world flow, the EP is a smash hit set to break records. Oh yeah, don’t forget he absolutely owned the crowd at Coachella Sunday night. 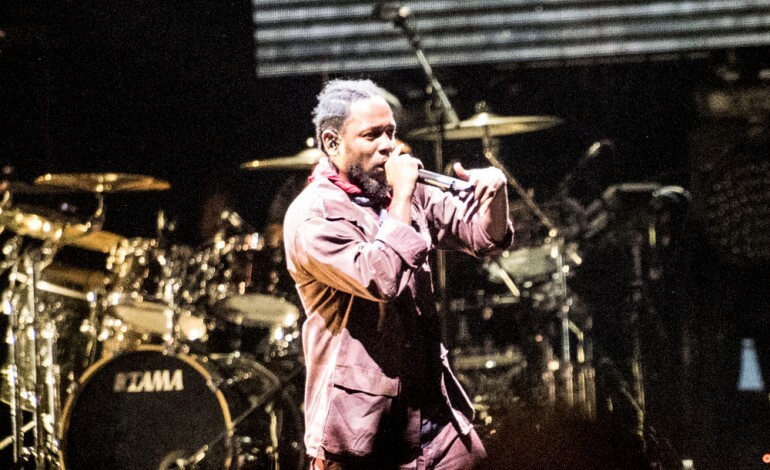 Considered by many to be the best closer of Coachella this year he brought out Travis Scott, Future and Schoolboy Q through out the set that showcased his new character Kung Fu Kenny the unforgiving master of rap.